Jimmy Hughes made my day! Yep, Jimmy Hughes made my day, Chilly Billy’s day, Charles Evans‘s day and Bill Bowker‘s day. XRDS.fm or 88.1 on your FM dial in Clarksdale. Try it out. Magical Madge, my beloved, spoke yesterday with Jimmy Hughes, retired head coach of the Clarksdale Wildcat’s football team. Jimmy told her he had started listening to XRDS.FM, the new, commercial free radio station broadcasting 24 hours a day out of the birthplace of the Blues: that’s right here in Sunflower River City—Clarksdale. One can listen to it within about a 10-mile radius of downtown Clarksdale or always online at XRDS.FM, also known as Crossroads FM. Jimmy says he now never changes the dial! How cool is that? Not only was Jimmy a successful coach of the Clarksdale Wildcats, but he is the only person I knew growing up who could ride the hell out of a unicycle and he was the first person to ever mention Red’s Lounge to me. I had moved back to Clarksdale with my oldest, teenage daughter almost ten years ago and was teaching school, broke as a joke, and never went out on the town and didn’t know a damn thing about the blues except I had them. Clint Davis—one of the categorically finest and brightest men I have ever known, I always have to mention that—let me con him into bartending at the newly opened Rust restaurant downtown, even though I really had no clue what I was doing, and the rest is history. Coach Hughes, who I had not seen since the late 70’s, came into Rust while I was bartending, and said, “Billy, we need to go to Red’s one night. Now, I have to be careful, because I don’t want to be a bad witness to my players (a coach who cared), but we ought to go in there some time after Rust closes. 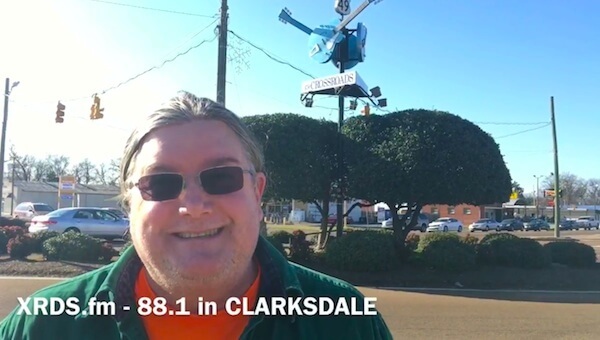 Clarksdale and XRDS.FM are both “people pumps!” Folks who love Clarksdale visit, then always sadly leave, tell others about us, then they and their friends come back, over and over again. If they will then listen to XRDS.FM, started by Charles Evans, a significant investor in Clarksdale real property and Bill Bowker, longtime Roots and Blues radio personality at KRUSH.FM in Northern California—both are great friends with Harmonica Boss Charlie Musselwhite, and all three spend a bunch of time in the town they love—then they will stay connected daily with a place visitors can’t quite ever shake. Ask Bowker where his young, awesome grandchildren want to spend their precious vacation time every year and you will hear, “Clarksdale!” Where does Charlie Musselwhite pass through any time he and his lovely wife Henri hear there is a plate lunch with a killa pork chop and about three to four Southern sides? Clarksdale! So, listen to XRDS.FM, get a feel for roots music that reflects the core of America and stay connected via Bowkers’s intuitive programming, Charlie Musselwhite’s weekly “Charlies’s Backroom,” “Rockabilly Roadhouse with Big Dave,” and famous, infamous and local musicians who love and keep Clarksdale vibrant and alive. Also, you will hear “Man on the Street” (MOTS) interviews with Clark House innkeeper and Delta Bohemian tour guide, Chilly Billy Howell, often recorded at the Crossroads of old Hwys 61 & 49, and at other seminal MS Delta locations. This Radio conntects me whenever I want to my beloved Clarksdale! To hear good music means to have a good feeling and and enjoy life. Thank you ALL for this! …………………..Gisela and I are coming with our best six friends to JJF 2017. I talked a lot about Clarksdale to them and now they want to see what I talked about!! Because: I came first for the music and came meanwhile 5 times back for the people and the music!! That is fantastic news, Guenter! You two really bless us here in Clarksdale! Billy and I look forward to seeing you and Gisela again and to meeting your best friends! They are going to finally get to see it all first-hand!